Unfortunately, there was no booze as a) it was too early in the morning and b) I am at the office with some work to do in parallel. And unfortunately no booze this evening either, some of the Fedora guys are out of town and Ceata is caught in a programming workshop. There is time in the following days. The install was smoother, as the experience with upgrading the desktop last week helped me to avoid wasting time with dreaded experiences GNOME Shell. I think I may continue the party with upgrading a CentOS box tomorrow. You know what the problem is, you people mention windows to much. Try to ignore it, build a micro cosmos around your in witch windows does not exist. If you live this way people around you will soon start to believe this is the only way. Think of this way, I for example had no ideea windows 7 was release I was focusing on the beta release of fedora and here you are on a blog about linux blabbing all out it. We don't have to pretend it does not exist, but we can ignore it most of the time. @Calin: I take you don't walk on the street to cross the big posters? You don't watch TV and get bombed with commercials? You don't work, as the large majority, in a mixed environment? I can continue you reply with "I take you don't walk on the street to cross the big posters? You don't watch TV and get bombed with commercials? Don't you read Nicu's blog ?...." Of course I do. The point here is that you are making free advertise to someone how does not deserver it. On the big picture, linux people (most of them) alway compare linux with windows. Check out some blogs about Mac OSX do you see any of that windows comparassion ? 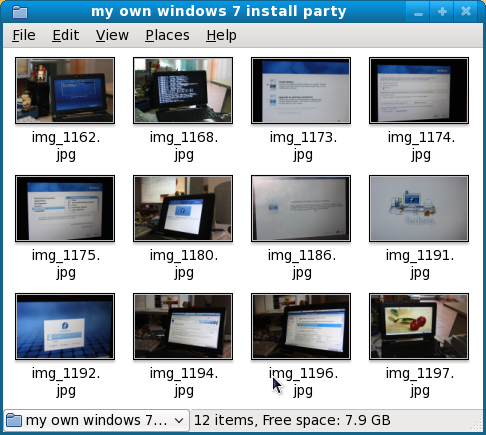 Try viewing windows as a parallel project more than a rival project. This way you will detach and start thinking out of the box. Think o it this way: did a microsoft guy made a blog post named "My own Fedora 12 beta release party" do they even mention linux on their blog posts, why do you think is that ? If it was after me I will make it as a rule for linux user "don't mention windows, don't compare linux or any linux related stuff to windows related stuff". Think about religious people, always comparing their gods, hows god is the best, hows god is the most powerful, what this any good ? unfortunately not until now this caused death and destruction. This is not related to your blog post specific, maybe this one is not the best example also, so please don't take it personally, this is a open discussion. The widest known OS X commercials are those with the "i am mac" and "i am pc" guys. The Mac blogs are all full with messages about how their OS is better than Windows. Of course a Microsoft blog will not talk about a Fedora release, because this is how marketing works. When you are the underdog you compare yourself all the time with the top players, when you are the top player you pretend the competition doesn't exist, to not legitimate it. I can't believe when I read your post-head. I thought you were really trying MS Windows 7, fortunately is not. But in some way, if you are always comparing with someone else, your life will be ruled by these comparisons. In some way I agree with Calvin, it is nice to make your Fedora party, but is not necessarily to do it at same time than MS Windows 7 party, or have a post-head related to Windows. Any way, I think that both OS have different market target. Thanks for sharing your experiences installing Fedora! Nice post, thank you for sharing this information with us. Your post is very beneficial for us and those who are searching Microsoft Windows 7 Support Phone Number 8003689219 in UK for instant support.